Quirkytogether is on the way! Those of you who have read my Quirkyalone book (published all the way back in 2004) know that quirkytogether is a very important chapter in the book. Quirkytogether is about quirky appreciation. Of ourselves. And others. Quirkytogether is about creating a relationship in which both parties get to be fully themselves. Quirkytogether is what happens when quirky joins together. It’s a quirkyalone in a relationship, co-creating a unique, intimate relationship with another person where people stay whole and turned-on. In 2013, we want to live in a world with a new kind of relationship, where we have intimate connections and partnership but we don’t necessarily merge, lose our individuality or our spark, and start wearing matching outfits and socializing at couples-only dinner parties! I’ve heard from one reader recently, that when a new girlfriend asked him to talk about defining their relationship, she asked “Should we be quirkytogether?” They had both read my Quirkyalone book. I’m creating an online course about Quirkytogether that will be offered in late July (stay tuned and watch this space for details–it’s going to be awesome and fun as well as deep and thought-provoking). Sign up here to be on the special quirkytogether class advance warning list so you’ll be the first to hear. I’m also in the research phase for a Quirkytogether book (which I’m quite excited about as well). To that end, I would like to invite you to be part of my research! –if you have been in a relationship where you lost yourself and your spark, and you want to be more quirkytogether next time, I want to hear from you too. Fill out this quirkytogether survey. Looking forward to reading about your thoughts and stories of quirkytogether. . .
Come join me and many other quirky souls For an indepenDANCE holiday retreat by the Stanisluas River, less than two hours from San Francisco. This camping getaway weekend is wonderfully relaxing, green, and invigorating. There will be a lot of ecstatic dancing in nature, yoga, meditation, massage, and river-rafting on a peaceful calm river. I went to this retreat last summer, and I can tell you, the grounds are divinely beautiful. It’s sort of like a private mini-Burning Man, but more green and relaxing. adults swinging by the river! 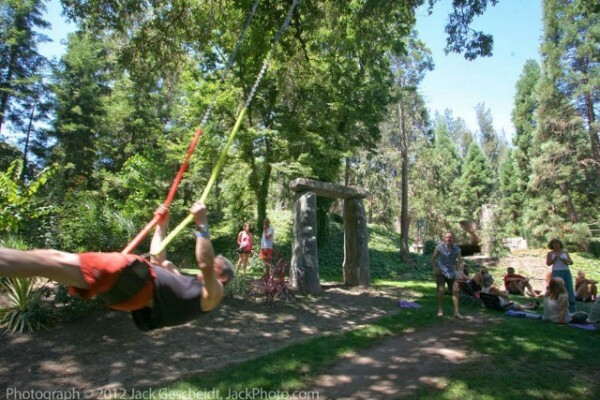 The organizers are running a special discount on this adventure until midnight Sunday night (6/30), so if you want to come get your groove on in nature, click over here and learn more–then get your tent and sleeping bag packed and ready! If you sign up, write “Heard about this from Sasha Cagen” when they ask you how you heard about this trip. Leave your cares, cell phones and computers behind. Come down to the river and play. FIND OUT MORE HERE!